Single-particle tracking (SPT) has become an important method to bridge biochemistry and cell biology since it allows direct observation of protein binding and diffusion dynamics in live cells. However, accurately inferring information from SPT studies is challenging due to biases in both data analysis and experimental design. To address analysis bias, we introduce ‘Spot-On’, an intuitive web-interface. 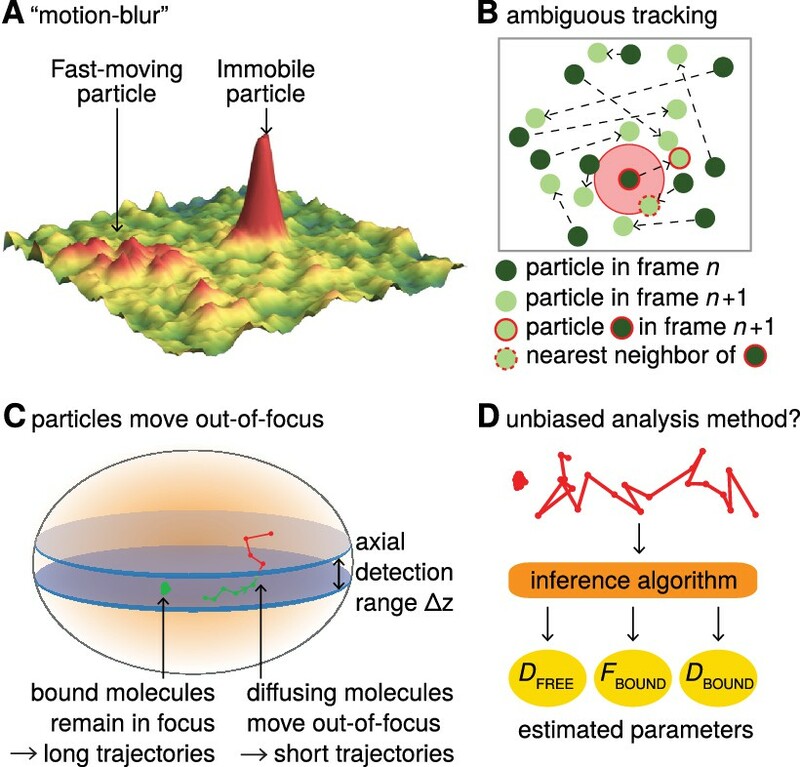 Spot-On implements a kinetic modeling framework that accounts for known biases, including molecules moving out-of-focus, and robustly infers diffusion constants and subpopulations from pooled single-molecule trajectories. To minimize inherent experimental biases, we implement and validate stroboscopic photo-activation SPT (spaSPT), which minimizes motion-blur bias and tracking errors. We validate Spot-On using experimentally realistic simulations and show that Spot-On outperforms other methods. We then apply Spot-On to spaSPT data from live mammalian cells spanning a wide range of nuclear dynamics and demonstrate that Spot-On consistently and robustly infers subpopulation fractions and diffusion constants. Proteins, the molecules that make up the cells’ internal machinery, are responsible for almost every process that keeps cells alive. Watching how proteins move and interact within a living cell can help scientists to better understand these biological mechanisms. Single-particle tracking is a recent technique that makes these observations possible by taking ‘live’ recordings of individual proteins in a cell. Typically, the goal of a single-particle tracking experiment is to assign proteins into groups, or subpopulations, based on the way they move in the cell. For example, one subpopulation may be bound to other cellular structures, a second moving freely at a high speed, and a third diffusing slowly. This informs on the biological roles of the proteins. The method involves an experimental stage and an analysis stage. During the experiment, proteins of interest are labeled with a small dye molecule that produces light when excited by a laser. The laser then illuminates the cell, stimulating all the labels in a thin layer. The position of each molecule is then determined with a microscope and a ‘snapshot’ taken. By repeating this process over multiple images, the movement of each molecule over time can be tracked. However, experimental problems can make the interpretation difficult. Motion blurring takes place when the proteins move so fast they appear as blurs in the images; tracking errors happen when so many proteins are present in the same space their trajectories overlap. Here, Hansen, Woringer et al. combine two pre-existing methods to improve the experimental set-up. Using lasers that flash like a strobe light reduces motion blurring by essentially taking snapshots of the proteins at short time intervals. Tracking errors are addressed by a technique whereby only one protein at a time produces light. Once the images are obtained and analyzed to yield trajectories, the trajectories themselves need to be analyzed to determine the number and properties of the protein subpopulations. Several factors can skew this analysis stage. For example, there is often a bias against fast-moving particles because the laser only lights up a thin layer of the cell. The proteins travelling slowly stay in focus long enough to be detected across many images; the fast ones quickly move out of the layer and are therefore counted less often. Hansen, Woringer et al. designed a free and user-friendly algorithm package called Spot-On to correct for this issue. Spot-On was thoroughly benchmarked against other solutions, demonstrating both its accuracy and robustness. Single-particle tracking can lead to misleading results if used incorrectly. It is essential to publically share solutions that help make this technique more rigorous, especially since a growing number of scientists have already started to use the method. Advances in imaging technologies, genetically encoded tags and fluorophore development have made single-particle tracking (SPT) an increasingly popular method for analyzing protein dynamics (Liu et al., 2015). Recent biological applications of SPT have revealed that transcription factors (TFs) bind mitotic chromosomes (Teves et al., 2016), how Polycomb interacts with chromatin (Zhen et al., 2016), that ‘pioneer factor’ TFs bind chromatin dynamically (Swinstead et al., 2016), that TF binding time correlates with transcriptional activity (Loffreda et al., 2017) and that different nuclear proteins adopt distinct target search mechanisms (Izeddin et al., 2014; Rhodes et al., 2017). Compared with indirect and bulk techniques such as Fluorescence Recovery After Photobleaching (FRAP) or Fluorescence Correlation Spectroscopy (FCS), SPT is often seen as less biased and less model-dependent (Goulian and Simon, 2000; Mueller et al., 2013; Shen et al., 2017). In particular, SPT makes it possible to directly follow single molecules over time in live cells and has provided clear evidence that proteins often exist in several subpopulations that can be characterized by their distinct diffusion coefficients (Mueller et al., 2013; Shen et al., 2017). For example, nuclear proteins such as TFs and chromatin binding proteins typically show a quasi-immobile chromatin-bound fraction and a freely diffusing fraction inside the nucleus. However, while SPT of slow-diffusing membrane proteins is an established technology (Weimann et al., 2013), 2D-SPT of proteins freely diffusing inside a 3D nucleus introduces several biases that must be corrected for in order to obtain accurate estimates of subpopulations. First, while a frame is acquired, fast-diffusing molecules move and spread out their emitted photons over multiple pixels causing a ‘motion-blur’ artifact (Berglund, 2010; Deschout et al., 2012; Frost et al., 2012; Goulian and Simon, 2000; Izeddin et al., 2014), whereas immobile or slow-diffusing molecules resemble point spread functions (PSFs; Figure 1A). This results in under-counting of the fast-diffusing subpopulation. Second, high particle densities tend to cause tracking errors when localized molecules are connected into trajectories. This can result in incorrect displacement estimates (Figure 1B). Third, since SPT generally employs 2D imaging of 3D motion, immobile or slow-diffusing molecules will generally remain in-focus until they photobleach and therefore exhibit long trajectories, whereas fast-diffusing molecules in 3D rapidly move out-of-focus, thus resulting in short trajectories (we refer to this as ‘defocalization’; Figure 1C). This results in a time-dependent under-counting of fast-diffusing molecules (Goulian and Simon, 2000; Kues and Kubitscheck, 2002). Fourth, SPT analysis methods themselves may introduce biases; to avoid this, an accurate and validated method is needed (Figure 1D). Bias in single-particle tracking (SPT) experiments and analysis methods. (A) ‘Motion-blur’ bias. Constant excitation during acquisition of a frame will cause a fast-moving particle to spread out its emission photons over many pixels and thus appear as a motion-blur, which make detection much less likely with common PSF-fitting algorithms. In contrast, a slow-moving or immobile particle will appear as a well-shaped PSF and thus readily be detected. (B) Tracking ambiguities. Tracking at high particle densities prevents unambiguous connection of particles between frames and tracking errors will cause displacements to be misidentified. (C) Defocalization bias. During 2D-SPT, fast-moving particles will rapidly move out-of-focus resulting in short trajectories, whereas immobile particles will remain in-focus until they photobleach and thus exhibit very long trajectories. This results in a bias toward slow-moving particles, which must be corrected for. (D) Analysis method. Any analysis method should ideally avoid introducing biases and accurately correct for known biases in the estimation of subpopulation parameters such as DFREE, FBOUND, DBOUND. Here, we introduce an integrated approach to overcome all four biases. The first two biases must be minimized at the data acquisition stage and we describe an experimental SPT method to do so (spaSPT), whereas the latter two can be overcome using a previously developed kinetic modeling framework (Hansen et al., 2017; Mazza et al., 2012) now extended and implemented in Spot-On. Spot-On is available as a web-interface (https://SpotOn.berkeley.edu) as well as Python and Matlab packages. Spot-On is a user-friendly web-interface that pedagogically guides the user through a series of quality-checks of uploaded datasets consisting of pooled single-molecule trajectories. It then performs kinetic model-based analysis that leverages the histogram of molecular displacements over time to infer the fraction and diffusion constant of each subpopulation (Figure 2). Spot-On does not directly analyze raw microscopy images, since a large number of localization and tracking algorithms exist that convert microscopy images into single-molecule trajectories (for a comparison of particle tracking methods, see (Chenouard et al., 2014); moreover, Spot-On can be one-click interfaced with TrackMate (Tinevez et al., 2017), which allows inspection of trajectories before uploading to Spot-On). To use Spot-On, a user uploads raw SPT data in the form of pooled SPT trajectories to the Spot-On web-interface. Spot-On then calculates displacement histograms. The user inputs relevant experimental descriptors and chooses a model to fit. After model-fitting, the user can then download model-inferred parameters, meta-data and download publication-quality figures. To use Spot-On, a user uploads their SPT trajectory data in one of several formats (Figure 2). Spot-On then generates useful meta-data for assessing the quality of the experiment (e.g. localization density, number of trajectories etc.). Spot-On also allows a user to upload multiple datasets (e.g. different replicates) and merge them. Spot-On then calculates and displays histograms of displacements over multiple time delays. The next step is model fitting. Spot-On models the distribution of displacements for each subpopulation using Brownian motion under steady-state conditions without state transitions (full model description in Materials and Methods). Spot-On also accounts for localization errors (either user-defined or inferred from the SPT data). Crucially, Spot-On corrects for defocalization bias (Figure 1C) by explicitly calculating the probability that molecules move out-of-focus as a function of time and their diffusion constant (Video 1). In fact, Spot-On uses the gradual loss of freely diffusing molecules over time as additional information to infer the diffusion constant and size of each subpopulation. Illustration of defocalization bias. Illustration of a single-particle tracking experiment with two subpopulations (one ‘immobile’, D = 0.001 µm²/s, the other ‘free’, D = 4 µm²/s with a 1:1 ratio, observed using 20 ms time interval). The red region corresponds to the axial detection range (1 µm) and molecules randomly appear when they photo-activate. 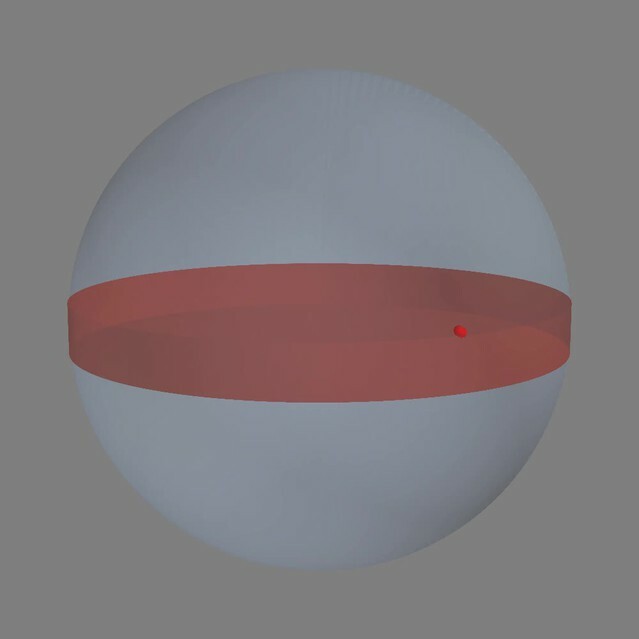 For each trajectory, the detected localizations inside the detection range are shown as red spheres and undetected localizations outside the detection range are shown as white spheres. Each particle has a mean lifetime of 15 frames, 25 nm localization error and trajectories consisting of at least two frames are plotted. Epi illumination is assumed. The SPT data was simulated and plotted using simSPT (available at https://gitlab.com/tjian-darzacq-lab/simSPT). Spot-On considers either 2 or 3 subpopulations. For instance, TFs in nuclei can generally exist in both a chromatin-bound state characterized by slow diffusion and a freely diffusing state associated with rapid diffusion. In this case, a 2-state model is generally appropriate (‘bound’ vs. ‘free’). Spot-On allows a user to choose their desired model and parameter ranges and then fits the model to the data. Using the previous example of TF dynamics, this allows the user to infer the bound fraction and the diffusion constants. Finally, once a user has finished fitting an appropriate model to their data, Spot-On allows easy download of publication-quality figures and relevant data (Figure 2; Full tutorial in Supplementary file 1). We first evaluated whether Spot-On could accurately infer subpopulations (Figure 1D) and successfully account for known biases (Figure 1C) using simulated data. We compared Spot-On to a popular alternative approach of first fitting the mean square displacement (MSD) of individual trajectories of a minimum length and then fitting the distribution of estimated diffusion constants (we refer to this as ‘MSDi’) as well as a sophisticated Hidden-Markov Model-based Bayesian inference method (vbSPT) (Persson et al., 2013). 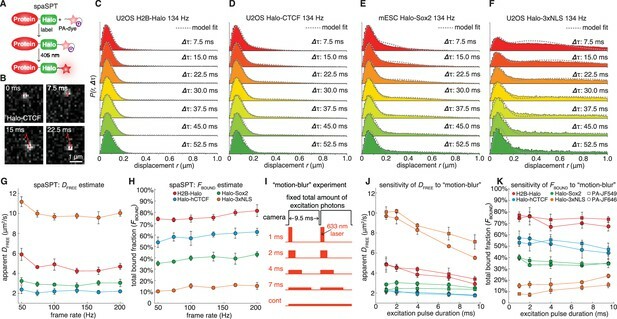 Since most SPT data is collected using highly inclined illumination (Tokunaga et al., 2008) (HiLo), we simulated TF binding and diffusion dynamics (2-state model: ‘bound vs. free’) confined inside a 4 µm radius mammalian nucleus under realistic HiLo SPT experimental settings subject to a 25 nm localization error (Figure 3—figure supplement 1). We considered the effect of the exposure time (1 ms, 4 ms, 7 ms, 13 ms, 20 ms), the free diffusion constant (from 0.5 µm²/s to 14.5 µm²/s in 0.5 µm²/s increments) and the bound fraction (from 0% to 95% in 5% increments) yielding a total of 3480 different conditions that span the full range of biologically plausible dynamics (Figure 3—figure supplements 2–3; Appendix 1). Spot-On accurately inferred subpopulation sizes with minimal error (Figure 3A–B, Table 1), but slightly underestimated the diffusion constant (−4.8%; Figure 3B; Table 1). However, this underestimate was due to particle confinement inside the nucleus: Spot-On correctly inferred the diffusion constant when the confinement was relaxed (Figure 3—figure supplement 4; 20 µm nuclear radius instead of 4 µm). This emphasizes that diffusion constants measured by SPT inside cells should be viewed as apparent diffusion constants. In contrast, the MSDi method failed under most conditions regardless of whether all trajectories were used (MSDi (all)) or a fitting filter applied (MSDi (R2 >0.8); Figure 3A–B; Table 1). vbSPT performed almost as well as Spot-On for slow-diffusing proteins, but showed larger deviations for fast-diffusing proteins (Figure 3—figure supplements 2–3). Validation of Spot-On using simulations and comparisons to other methods. (A–B) Simulation results. Experimentally realistic SPT data was simulated inside a spherical mammalian nucleus with a radius of 4 μm subject to highly-inclined and laminated optical sheet illumination (Tokunaga et al., 2008) (HiLo) of thickness 4 μm illuminating the center of the nucleus. The axial detection window was 700 nm with Gaussian edges and particles were subject to a 25 nm localization error in all three dimensions. Photobleaching corresponded to a mean trajectory length of 4 frames inside the HiLo sheet and 40 outside. 3480 experiments were simulated with parameters of DFREE=[0.5;14.5] in steps of 0.5 μm2/s and FBOUND=[0;95% in steps of 5% and the frame rate correspond to Δτ=[1,4,7,10,13,20] ms. Each experiment was then fitted using Spot-On, using vbSPT (maximum of 2 states allowed) (Persson et al., 2013), MSDi using all trajectories of at least five frames (MSDi (all)) or MSDi using all trajectories of at least five frames where the MSD-curvefit showed at least R2 >0.8 (MSDi (R2 >0.8)). (A) shows the distribution of absolute errors in the FBOUND–estimate and (B) shows the distribution of relative errors in the DFREE–estimate. (C) Single simulation example with DFREE = 2.0 µm2/s; FBOUND = 70%; 7 ms per frame. The table on the right uses numbers from CDF-fitting, but for simplicity the fits to the histograms (PDF) are shown in the three plots. (D) Single simulation example with DFREE = 14.0 µm2/s; FBOUND = 50%; 20 ms per frame. Full details on how SPT data was simulated and analyzed with the different methods is given in Appendix 1. Summary of simulation results and comparison of methods. The table shows the bias (mean error), ‘std’ (standard deviation) and ‘iqr’ (inter-quartile range: difference between the 75th and 25th percentile) for each method for all 3480 simulations. The left column shows the relative bias/std/iqr for the DFREE-estimate and the right column shows the absolute bias/std/iqr for the FBOUND-estimate. To illustrate how the methods could give such divergent results when run on the same SPT data, we considered two example simulations (Figure 3C–D; more examples in Figure 3—figure supplement 3). First, we considered a mostly bound and relatively slow diffusion case (DFREE: 2.0 µm²/s; FBOUND: 70%; Δτ: 7 ms; Figure 3C). Spot-On and vbSPT accurately inferred both DFREE and FBOUND. In contrast, MSDi (R2 > 0.8) greatly underestimated FBOUND (13.6% vs. 70%), whereas MSDi (all) slightly overestimated FBOUND. Since MSDi-based methods apply two thresholds (first, minimum trajectory length: here five frames; second, filtering based on R2) in many cases less than 5% of all trajectories passed these thresholds and this example illustrate how sensitive MSDi-based methods are to these thresholds. Note that although we show the fits to the probability density function since this is more intuitive (PDF; histogram), we performed the fitting to the cumulative distribution function (CDF). Second, we considered an example with a slow frame rate and fast diffusion, such that the free population rapidly moves out-of-focus (DFREE: 14.0 µm²/s; FBOUND: 50%; Δτ: 20 ms; Figure 3D). Spot-On again accurately inferred FBOUND, and slightly underestimated DFREE due to high nuclear confinement (Figure 3—figure supplement 4). Although vbSPT generally performed well, because it does not correct for defocalization bias (vbSPT was developed for bacteria, where defocalization bias is minimal), vbSPT strongly overestimated FBOUND in this case (Figure 3D). Consistent with this, Spot-On without defocalization-bias correction also strongly overestimates the bound fraction (Figure 3—figure supplement 5). We conclude that correcting for defocalization bias is critical. The MSDi-based methods again gave divergent results despite seemingly fitting the data well. Thus, a good fit to a histogram of log(D) does not necessarily imply that the inferred DFREE and FBOUND are accurate. A full discussion and comparison of the methods is given in Appendix 1. Finally, we extended this analysis of simulated SPT data to three states (one ‘bound’, two ‘free’ states) and compared Spot-On and vbSPT. Spot-On again accurately inferred both the diffusion constants and subpopulation fractions of each population and slightly outperformed vbSPT (Figure 3—figure supplement 6). Having established that Spot-On is accurate, we next tested whether it was also robust. Spot-On’s ability to infer DFREE and FBOUND was robust to misestimates of the axial detection range of ~100–200 nm (Figure 3—figure supplement 7), was minimally affected by the number of timepoints considered and fitting parameters (Figure 3—figure supplements 8–9; see also Appendix 2 for parameter considerations) and was not strongly affected by state changes (e.g. binding or unbinding) provided the time-scale of state changes is significantly longer than the frame rate (Figure 3—figure supplement 10). Moreover, Spot-On inferred the localization error with nanometer precision provided that a significant bound fraction is present (Figure 3—figure supplement 11). Finally, we sub-sampled the data sets and found that just ~3000 short trajectories (mean length ~3–4 frames) were sufficient for Spot-On to reliably infer the underlying dynamics (Figure 3—figure supplement 12). We conclude that Spot-On is robust. Taken together, this analysis of simulated SPT data suggests that Spot-On successfully overcomes defocalization and analysis method biases (Figure 1C–D), accurately and robustly estimates subpopulations and diffusion constants across a wide range of dynamics and, finally, outperforms other methods. Having validated Spot-On on simulated data, which is not subject to experimental biases (Figure 1A–B), we next sought to evaluate Spot-On on experimental data. To generate SPT data with minimal acquisition bias we performed stroboscopic photo-activation SPT (spaSPT; Figure 4A), which integrates previously and separately published ideas to minimize experimental biases. First, spaSPT minimizes motion-blurring, which is caused by particle movement during the camera exposure time (Figure 1A), by using stroboscopic excitation (Elf et al., 2007; Frost et al., 2012). We found that the bright and photo-stable dyes PA-JF549 and PA-JF646 (Grimm et al., 2016a) in combination with the HaloTag (‘Halo’) labeling strategy made it possible to achieve a signal-to-background ratio greater than 5 with just 1 ms excitation pulses, thus providing a good compromise between minimal motion-blurring and high signal (Figure 4B). Second, spaSPT minimizes tracking errors (Figure 1B) by using photo-activation (Figure 4A) (Grimm et al., 2016a; Manley et al., 2008). Tracking errors are generally caused by high particles densities. Photo-activation allows tracking at extremely low densities (≤1 molecule per nucleus per frame) and thereby minimizes tracking errors (Izeddin et al., 2014), whilst at the same time generating thousands of trajectories. To consider the full spectrum of nuclear protein dynamics, we studied histone H2B-Halo (overwhelmingly bound; fast diffusion; Figure 4C), Halo-CTCF (Hansen et al., 2017) (largely bound; slow diffusion; Figure 4D) and Halo-NLS (overwhelmingly free; very fast diffusion; Figure 4F) in human U2OS cells and Halo-Sox2 (Teves et al., 2016) (largely free; intermediate diffusion; Figure 4E) in mouse embryonic stem cells (mESCs). We labeled Halo-tagged proteins in live cells with the HaloTag ligands PA-JF549 or PA-JF646 (Grimm et al., 2016a) and performed spaSPT using HiLo illumination (Video 2). To generate a large dataset to comprehensively test Spot-On, we performed 1064 spaSPT experiments across 60 different conditions. Overview of spaSPT and experimental results. (A) spaSPT. HaloTag-labeling with UV (405 nm) photo-activatable dyes enable spaSPT. spaSPT minimizes tracking errors through photo-activation which maintains low densities. (B) Example data. Raw spaSPT images for Halo-CTCF tracked in human U2OS cells at 134 Hz (1 ms stroboscopic 633 nm excitation of JF646). (C–F) Histograms of displacements for multiple Δτ of histone H2B-Halo in U2OS cells (C), Halo-CTCF in U2OS cells (d), Halo-Sox2 in mES cells (E) and Halo-3xNLS in U2OS cells (F). (G–H) Effect of frame-rate on DFREE and FBOUND. spaSPT was performed at 200 Hz, 167 Hz, 134 Hz, 100 Hz, 74 Hz and 50 Hz using the 4 cell lines and the data fit using Spot-On and a 2-state model. Each experiment on each cell line was performed in four replicates on different days and ~5 cells imaged each day. (I) Motion-blur experiment. To investigate the effect of ‘motion-blurring’, the total number of excitation photons was kept constant, but delivered during pulses of duration 1, 2, 4, 7 ms or continuous (cont) illumination. (J–K) Effect of motion-blurring on DFREE and FBOUND. spaSPT data was recorded at 100 Hz and 2-state model-fitting performed with Spot-On. The inferred DFREE (J) and FBOUND (K) were plotted as a function of excitation pulse duration. Each experiment on each cell line was performed in four replicates on different days and ~5 cells imaged each day. Error bars show standard deviation between replicates. Representative raw spaSPT movie (Halo-hCTCF at 134 Hz). spaSPT movie (1 ms of 633 nm laser delivered at the beginning of each frame; 405 nm laser photo-activation pulses delivered in between frames) of endogenously tagged CTCF (C32 Halo-hCTCF) in human U2OS cells imaged at ~134 Hz (7.477 ms per frame). Dye: PA-JF646. One pixel: 160 nm. First, we studied whether Spot-On could consistently infer subpopulations over a wide range of frame rates. We experimentally determined the axial detection range to be ~700 nm (Figure 4—figure supplement 1) and performed spaSPT at 200 Hz, 167 Hz, 134 Hz, 100 Hz, 74 Hz and 50 Hz using the four cell lines. Spot-On consistently inferred the diffusion constant (Figure 4G) and total bound fraction across the wide range of frame rates (Figure 4H). This is notable since all four proteins exhibit apparent anomalous diffusion (Figure 4—figure supplement 2) and this demonstrates that Spot-On is also robust to anomalous diffusion despite modeling Brownian motion. While the ground-truth is unknown when considering experiments, Spot-On gave biologically reasonable results: histone H2B was overwhelmingly bound and free Halo-3xNLS was overwhelmingly unbound (comparison with vbSPT: Figure 4—figure supplement 3). These results provide additional validation for the bias corrections implemented in Spot-On. We also note that although Spot-On was validated on spaSPT data, SPT data with non-photoactivatable dyes is also suitable for Spot-On analysis provided that the density is sufficiently low to minimize tracking errors (see also Appendix 3: "Which datasets are appropriate for Spot-On?”). Finally, we demonstrated above that just ~3000 short trajectories (mean length ~3–4 frames) were sufficient for Spot-On to accurately infer DFREE and FBOUND (Figure 3—figure supplement 12). Here we obtain well above 3000 trajectories per cell even at ~1 localization/frame. More generally, with spaSPT this should be generally achievable for all but the most lowly expressed nuclear proteins. Thus, this now makes it possible to study biological cell-to-cell variability in TF dynamics. Having validated Spot-On on experimental SPT data, we next applied Spot-On to estimate the effect of motion-blurring on the estimation of subpopulations. As mentioned, since most localization algorithms (Chenouard et al., 2014; Sergé et al., 2008) achieve super-resolution through PSF-fitting, this may cause motion-blurred molecules to be undersampled, resulting in a bias towards slow-moving molecules (Figure 1A). We estimated the extent of the bias by imaging the four cell lines at 100 Hz and keeping the total number of excitation photons constant, but varying the excitation pulse duration (1 ms, 2 ms, 4 ms, 7 ms, constant; Figure 4I). For generality, we performed these experiments using both PA-JF549 and PA-JF646 dyes (Grimm et al., 2016a). We used Spot-On to fit the data and plotted the apparent free diffusion constant (Figure 4J) and apparent total bound fraction (Figure 4K) as a function of the excitation pulse duration. For fast-diffusing proteins like Halo-3xNLS and H2B-Halo, motion-blurring resulted in a large underestimate of the free diffusion constant, whereas the effect on slower proteins like CTCF and Sox2 was minor (Figure 4J). Regarding the total bound fraction, motion-blurring caused a ~2 fold overestimate for rapidly diffusing Halo-3xNLS (Figure 4K), but had a minor effect on slower proteins like H2B, CTCF and Sox2. Similar results were obtained for both dyes for proteins with a significant bound fraction, but we note that JF549 appears to better capture the dynamics of proteins with a minimal bound fraction such as Halo-3xNLS (Figure 4J–K). Finally, we note that the extent of the bias due to motion-blurring will likely be very sensitive to the localization algorithm. Here, using the MTT-algorithm (Sergé et al., 2008), motion-blurring caused up to a 2-fold error in both the DFREE and FBOUND estimates. Taken together, these results suggest that Spot-On can reliably be used even for SPT data collected under constant illumination provided that protein diffusion is sufficiently slow and, moreover, provides a helpful guide for optimizing SPT imaging acquisitions (we include a full discussion of considerations for SPT acquisitions and a proposal for minimum reporting standards in SPT in Appendix 3 and 4). In summary, SPT is an increasingly popular technique and has been revealing important new biological insight. However, a clear consensus on how to perform and analyze SPT experiments is currently lacking. In particular, 2D SPT of fast-diffusing molecules inside 3D cells is subject to a number of inherent experimental (Figure 1A–B) and analysis (Figure 1C–D) biases, which can lead to inaccurate conclusions if not carefully corrected for. Here, we introduce approaches for accounting for both experimental and analysis biases. Several methods are available for localization/tracking (Chenouard et al., 2014; Sergé et al., 2008) and for classification of individual trajectories (Monnier et al., 2015; Persson et al., 2013). Spot-On now complements these tools by providing a bias-corrected, comprehensive open-source framework for inferring subpopulations and diffusion constants from pooled SPT data and makes this platform available through a convenient web-interface. This platform can easily be extended to other diffusion regimes (Metzler et al., 2014) and models (Lee et al., 2017) and, as 3D SPT methods mature, to 3D SPT data. Moreover, spaSPT provides an acquisition protocol for tracking fast-diffusing molecules with minimal bias. We hope that these validated tools will help make SPT more accessible to the community and contribute positively to the emergence of ‘gold-standard’ acquisition and analysis procedures for SPT. Methods for a full description. software, algorithm MSDi; vbSPT; this paper and Persson et al. DOI: 10.1038/nmeth.4034 PA-JF549 Please contact Luke D Lavis for distribution. DOI: 10.1038/nmeth.4034 PA-JF646 Please contact Luke D Lavis for distribution. Spot-On implements and extends a kinetic modeling framework first described in Mazza et al. (2012) and later extended in Hansen et al. (2017). Briefly, the model infers the diffusion constant and relative fractions of two or three subpopulations from the distribution of displacements (or histogram of displacements) computed at increasing lag time (1Δτ, 2Δτ,. ..). This is performed by fitting a semi-analytical model to the empirical histogram of displacements using non-linear least squares fitting. Defocalization is explicitly accounted for by modeling modeling the fraction of particles that remain in focus over time as a function of their diffusion constant. Although Δzcorr depend on the number of gaps (g) allowed in the tracking, we will leave it out for simplicity in the following. We determined the coefficients a and b from Monte Carlo simulations. For a given diffusion constant, D, 50,000 molecules were randomly placed one-dimensionally along the z-axis drawn from a uniform distribution from zMIN=−Δz/2 to zMAX=Δz/2. Next, using a time-step Δτ, one-dimensional Brownian diffusion was simulated along the z-axis using the Euler-Maruyama scheme. For time delays from 1Δτ to 15Δτ, the fraction of molecules that were lost was calculated in the range of D=[1;12] μm2/s. a(Δz,Δτ,g) and b(Δz,Δτ,g) were then estimated through least-squares fitting of Premaining(Δτ,Δzcorr,D) to the simulated fraction remaining. The process was repeated over a grid of plausible values of (Δz,Δτ,g) to derive a grid of 134,865 (a,b) parameter pairs. This pre-calculated library of (a,b) parameters enables Spot-On to perform model fitting on nearly any SPT dataset with minimal overhead. Where ZCORR(Δτ,Δzcorr,D) is as described above. Spot-On calculates the empirical histogram of displacements based on a user-defined bin width. Spot-On allows the user to choose between PDF- and CDF-fitting of the kinetic model to the empirical displacement distributions; CDF-fitting is generally most accurate for smaller datasets and the two are similar for large datasets (Figure 3—figure supplement 9). The integral in ZCORR(Δτ,Δzcorr) was numerically evaluated using the midpoint method over 200 points and the terms of the series computed until the term falls below a threshold of 10−10. Model fitting and parameter optimization was performed using a non-linear least squares algorithm (Levenberg-Marquardt). Random initial parameter guesses are drawn uniformly from the user-specified parameter range. The optimization is then repeated several times with different initialization parameters to avoid local minima. Spot-On constrains each fraction to be between 0 and 1 and for the sum of the fractions to equal 1. Although Spot-On performs well on both experimental and simulated SPT data, the model implemented by Spot-On has several limitations. First, the kinetic model assumes diffusion to be ideal Brownian motion, even though it is widely acknowledged that the motion of most proteins inside a cell shows some degree of anomalous diffusion. Nevertheless, Figure 4G–H and Figure 4—figure supplement 2 show that the parameter inference for experimental data of proteins presenting various degrees of anomalous diffusion is quite robust. Second, Spot-On models the localization error as the static mean localization error and this feature can be used to infer the actual localization error from the data. However, the localization error is affected both by the position of the particle with respect to the focal plane (Lindén et al., 2017) and by motion blur (Deschout et al., 2012). Even though a high signal-to-background ratio and fast framerate/stroboscopic illumination help to mitigate these disparities, it is likely that the localization error of fast moving particles will be higher than the bound/slow-moving particles. In that case, one would expect Spot-On to infer a localization error that is the weighted mean of the ‘bound/static’ localization error and the ‘free’ localization error. However, in many situations DfreeΔτ>> σ2 (even assuming a 2 µm²/s particle imaged at a 5 ms framerate with a ~30 nm localization error, there is still an order of magnitude difference between the two terms). As a consequence, the estimate of σ reflects the static localization error (that is, the localization error of the bound fraction), and the localization error estimate becomes less reliable if the bound fraction is very small (Figure 3—figure supplement 11). Third, following (Kues and Kubitscheck, 2002) the axial detection profile is assumed to be a step function, which is an approximation. However, all simulations here were performed using a detection profile with Gaussian edges (Figure 3—figure supplement 1) and as shown in Figure 3A–B Spot-On still works quite well and moreover is relatively robust to slight mismatches in the axial detection range (Figure 3—figure supplement 7). Fourth, unlike the original implementation by Mazza et al. (2012), Spot-On ignores state transitions. This reduces the number of fitted parameters and simplifies the generalization to more than two states, but as shown in Figure 3—figure supplement 10 it also causes the parameter inference to fail unless the timescale of state changes is at least 10–50 times longer than the frame rate. Thus, in cases where a molecule is known to exhibit state changes on a time-scale of tens to a few hundreds of milliseconds, Spot-On may not be appropriate. Fifth and finally, Spot-On ignores correlations between adjacent displacements, although taking such information into account can potentially improve the parameter inference (Vestergaard et al., 2014). Halo-Sox2 (Teves et al., 2016) knock-in JM8.N4 mouse embryonic stem cells ((Pettitt et al., 2009) Research Resource Identifier: RRID:CVCL_J962; obtained from the KOMP Repository at UC Davis) were grown on plates pre-coated with a 0.1% autoclaved gelatin solution (Sigma-Aldrich, St. Louis, MO, G9391) under feeder free conditions in knock-out DMEM with 15% FBS and LIF (full recipe: 500 mL knockout DMEM (ThermoFisher, Waltham, MA, #10829018), 6 mL MEM NEAA (ThermoFisher #11140050), 6 mL GlutaMax (ThermoFisher #35050061), 5 mL Penicillin-streptomycin (ThermoFisher #15140122), 4.6 μL 2-mercapoethanol (Sigma-Aldrich M3148), 90 mL fetal bovine serum (HyClone Logan, UT, FBS SH30910.03 lot #AXJ47554)) and LIF. mES cells were fed by replacing half the medium with fresh medium daily and passaged every two days by trypsinization. Halo-3xNLS, H2B-Halo-SNAP and knock-in C32 Halo-CTCF (Hansen et al., 2017) Human U2OS osteosarcoma cells (Research Resource Identifier: RRID:CVCL_0042) were grown in low glucose DMEM with 10% FBS (full recipe: 500 mL DMEM (ThermoFisher #10567014), 50 mL fetal bovine serum (HyClone FBS SH30910.03 lot #AXJ47554) and 5 mL Penicillin-streptomycin (ThermoFisher #15140122)) and were passaged every 2–4 days before reaching confluency. For live-cell imaging, the medium was identical except DMEM without phenol red was used (ThermoFisher #31053028). Both mouse ES and human U2OS cells were grown in a Sanyo copper alloy IncuSafe humidified incubator (MCO-18AIC(UV)) at 37°C/5.5% CO2. Cell lines were pathogen tested and authenticated through STR profiling (U2OS) as described previously (Hansen et al., 2017; Teves et al., 2016). All cell lines will be provided upon request. The indicated cell line was grown overnight on plasma-cleaned 25 mm circular no 1.5H cover glasses (Marienfeld, Germany, High-Precision 0117650) either directly (U2OS) or MatriGel coated (mESCs; Fisher Scientific, Hampton, NH, #08-774-552 according to manufacturer’s instructions just prior to cell plating). After overnight growth, cells were labeled with 5–50 nM PA-JF549 or PA-JF646 (Grimm et al., 2016a) for ~15–30 min and washed twice (one wash: medium removed; PBS wash; replenished with fresh medium). At the end of the final wash, the medium was changed to phenol red-free medium keeping all other aspects of the medium the same. Single-molecule imaging was performed on a custom-built Nikon TI microscope (Nikon Instruments Inc., Melville, NY) equipped with a 100x/NA 1.49 oil-immersion TIRF objective (Nikon apochromat CFI Apo TIRF 100x Oil), EM-CCD camera (Andor, Concord, MA, iXon Ultra 897; frame-transfer mode; vertical shift speed: 0.9 μs; −70°C), a perfect focusing system to correct for axial drift and motorized laser illumination (Ti-TIRF, Nikon), which allows an incident angle adjustment to achieve highly inclined and laminated optical sheet illumination (Tokunaga et al., 2008). The incubation chamber maintained a humidified 37°C atmosphere with 5% CO2 and the objective was also heated to 37°C. Excitation was achieved using the following laser lines: 561 nm (1 W, Genesis Coherent, Santa Clara, CA) for PA-JF549; 633 nm (1 W, Genesis Coherent, Pala Alto, CA) for PA-JF646; 405 nm (140 mW, OBIS, Coherent) for all photo-activation experiments. The excitation lasers were modulated by an acousto-optic Tunable Filter (AA Opto-Electronic, France, AOTFnC-VIS-TN) and triggered with the camera TTL exposure output signal. The laser light is coupled into the microscope by an optical fiber and then reflected using a multi-band dichroic (405 nm/488 nm/561 nm/633 nm quad-band, Semrock, Rochester, NY) and then focused in the back focal plane of the objective. Fluorescence emission light was filtered using a single band-pass filter placed in front of the camera using the following filters: PA-JF549: Semrock 593/40 nm bandpass filter; PA-JF646: Semrock 676/37 nm bandpass filter. The microscope, cameras, and hardware were controlled through NIS-Elements software (Nikon). The spaSPT experimental settings for Figure 4G–H were as follows: 1 ms 633 nm excitation (100% AOTF) of PA-JF646 was delivered at the beginning of the frame; 405 nm photo-activation pulses were delivered during the camera integration time (~447 μs) to minimize background and their intensity optimized to achieve a mean density of ≤1 molecule per frame per nucleus. 30,000 frames were recorded per cell per experiment. The camera exposure times were: 4.5 ms, 5.5 ms, 7 ms, 9.5 ms, 13 ms and 19.5 ms.
For the motion-blur spaSPT experiments (Figure 4I–K), the camera exposure was fixed to 9.5 ms and photo-activation performed as above. To keep the total number of delivered photons constant, we generated an AOTF-laser intensity calibration curve using a power meter and adjusted the AOTF transmission accordingly for each excitation pulse duration. The excitation settings were as follows: 1 ms, 561 nm 100% AOTF, 633 nm 100% AOTF; 2 ms, 561 nm 43% AOTF, 633 nm 40% AOTF; 4 ms, 561 nm 28% AOTF, 633 nm 27% AOTF; 7 ms, 561 nm 20% AOTF, 633 nm 19% AOTF; constant illumination, 561 nm 17% AOTF, 633 nm 16% AOTF. We developed a utility to simulate diffusing proteins in a confined geometry (simSPT). Briefly, simSPT simulates the diffusion of an arbitrary number of populations of molecules characterized by their diffusion coefficient, under a steady state assumption. Particles are drawn at random between the populations and their location in the 3D nucleus is initialized following a uniform law within the confinement volume. The lifetime of the particle (in frames) is also drawn following an exponential law of mean lifetime β. Then, the particle diffuses in 3D until it bleaches. Diffusion is simulated by drawing jumps following a normal law of parameters N(0,2DΔτ), where D is the diffusion coefficient and Δτ the exposure time. Finally, a localization error (N0,σ) is added to each (x,y,z) localization in the simulated trajectories. For comparisons of Spot-On, MSDi and vbSPT using a 2-state scenario, we parameterized simSPT to consider two subpopulations of particles diffusing in a sphere (the nucleus) of 8 µm diameter illuminated using HiLo illumination (assuming a HiLo beam width of 4 µm), with an axial detection range of ~700 nm, centered at the middle of the HiLo beam with Gaussian edges. Molecules are assumed to have a mean lifetime of 4 frames (when inside the HiLo beam) and of 40 frames when outside the HiLo beam. The localization error was set to 25 nm and the simulation was run until 100,000 in-focus trajectories were recorded. More specifically, the effect of the exposure time (1 ms, 4 ms, 7 ms, 13 ms, 20 ms), the free diffusion constant (from 0.5 µm²/s to 14.5 µm²/s in 0.5 µm²/s increments) and the fraction bound (from 0% to 95% in 5% increments) were investigated, yielding a dataset consisting of 3480 simulations. More details on the simulations, including scripts to reproduce the dataset, are available on GitLab as detailed in the ‘Computer code’ section. Full details on how the simulations were analyzed by Spot-On, vbSPT and MSDi are given in Appendix 1. We also considered a 3-state scenario featuring a bound subpopulation (‘bound’), a relatively slow diffusing free subpopulation (‘slow’) and a relatively faster diffusing free subpopulation (‘free’). In this case, we only compared Spot-On and vbSPT (Figure 3—figure supplement 6), since the MSDi methods did not perform well. As in the 2-state simulations, we parameterized simSPT to consider that three subpopulations of particles diffusing in a sphere (the nucleus) of 8 µm diameter illuminated using HiLo illumination (assuming a HiLo beam width of 4 µm), with an axial detection range of ~700 nm, centered at the middle of the HiLo beam with Gaussian edges. Molecules are assumed to have a mean lifetime of 4 frames (when inside the HiLo beam) and of 40 frames when outside the HiLo beam. The localization error was set to 40 nm and the simulation was run until 100,000 in-focus trajectories were recorded. We considered three different subpopulation conditions: (1) FBOUND = 25%; FSLOW = 25%; FFAST = 50%; (2) FBOUND = 25%; FSLOW = 50%; FFAST = 25%; (3) FBOUND = 50%; FSLOW = 25%; FFAST = 25%. Specifically, for each of these condition, the effect of of the exposure time (1 ms, 4 ms, 7 ms, 10 ms, 13 ms, 20 ms), the slower free diffusion constant (from 0.5 µm²/s to 2.5 µm²/s in 0.5 µm²/s increments) and the faster free diffusion constant (from 4 µm²/s to 11 µm²/s in 1 µm²/s increments) were investigated, yielding a dataset of 720 simulations. Both vbSPT and Spot-On (all) were constrained to three subpopulations. Full details on how the simulations were analyzed by Spot-On and vbSPT are given in Appendix 1. To systematically evaluate the performance of Spot-On as well as other common analysis tools such as MSDi and vbSPT (Persson et al., 2013), we developed simSPT, a simulation tool to generate a comprehensive set of realistic SPT simulations spanning the range of plausible dynamics (almost a billion trajectories were simulated in total). simSPT is freely available at GitLab: https://gitlab.com/tjian-darzacq-lab/simSPT. simSPT simulates 3D SPT trajectories arising from an arbitrary number of subpopulations confined inside a sphere under HiLo illumination and takes into account a limited axial detection range, realistic photobleaching rates and optionally state interconversion. The simulation methods are described in detail at GitLab. Briefly, we parameterized simSPT to consider that particles diffuse inside a sphere (the nucleus) of 8 µm diameter illuminated using HiLo illumination (assuming a HiLo beam width of 4 µm), with an axial detection range of ~700 nm with Gaussian edges, centered at the middle of the HiLo beam. Molecules are assumed to have a mean lifetime of 4 frames (when inside the HiLo beam) and of 40 frames when outside the HiLo beam. For the 2-state comparisons, the localization error was set to 25 nm and the simulation was run until 100,000 in-focus trajectories were recorded. More specifically, the effect of the time between frames (1 ms, 4 ms, 7 ms, 13 ms, 20 ms), the free diffusion constant (from 0.5 µm²/s to 14.5 µm²/s in 0.5 µm²/s increments) and the fraction bound (from 0% to 95% in 5% increments) were investigated, yielding a dataset consisting of 3480 simulations. All 3480 simulated datasets are also available (see Data Availability section). The advantage of simulations is that the ground truth is known. For the 3-state comparisons (Figure 3—figure supplement 6), the localization error was set to 40 nm and the simulation was run until 100,000 in-focus trajectories were recorded. We then simulated one bound state (DBOUND=0.001 µm²/s) and two free states (DSLOW=0.5 to 2.5 µm²/s in 0.5 µm²/s increments; DFAST= 4.0 to 11.0 µm²/s in 1.0 µm²/s increments) and also varying the fractions (FBOUND=25%, FSLOW=25%, FFAST= 50%; or FBOUND=25%, FSLOW=50%, FFAST= 25%; or FBOUND=50%, FSLOW=25%, FFAST= 25%;) as was the time between frames (1 ms, 4 ms, 7 ms, 10, 13 ms, 20 ms). For more specific simulations, extra parameters were varied, such as the width of the axial detection range (Figure 3—figure supplement 7), localization error (Figure 3—figure supplement 11), or the presence/absence of interconversion between states (Figure 3—figure supplement 10). In the case of the main 3480 simulated SPT datasets for the 2-state comparison, we analyzed the data using the Matlab version of Spot-On (either using JumpsToConsider = 4 or all), MSDi (either R2 >0.8 or all) or vbSPT. We describe the analysis in details below. CDF-fitting was then performed in MATLAB R2014b using the Matlab version of Spot-On (v1.0; GitLab tag 1f9f782b) and the estimated free diffusion constant, DFREE, and bound fraction, FBOUND, recorded for each of the 3480 simulations. The estimated DFREE and FBOUND were then compared to the ground truth known from the simulations. Three parameters were estimated in the fit. Spot-On (4 jumps) performs slightly worse than Spot-On (all) when it comes to estimating FBOUND as expected and essentially identically to Spot-On (all) for estimating DFREE. The mean error (bias) for estimating FBOUND was −6.4%, the inter-quartile range (IQR) was 5.9% and the standard deviation 3.6%. The origin of the error is the undercounting of the bound population due to considering only the first 4 jumps. Since bound molecules remain in focus until they bleach, they always yield only a single trajectory, whereas a single freely diffusing molecule has a probability of yielding multiple trajectories by diffusing in-focus for a while, then moving out-of-focus for a while and then moving back in-focus. For estimating DFREE the bias for Spot-On (4 jumps) was −5.4%, the IQR 3.6% and the standard deviation 3.2%. However, as shown in Figure 3—figure supplements 2 and 4, the slight underestimate of the free diffusion constant is not due to a limitation of Spot-On, but instead due to confinement inside the nucleus (Figure 3—figure supplement 4). For example, a diffusing molecule close to the nuclear boundary moving towards the nuclear boundary will ‘bounce back’ resulting in a large distance travelled, but only a smaller recorded displacement. We validated that this indeed is the origin of the underestimate of DFREE by considering a nucleus with virtually no confinement (20 μm radius) and found that the DFREE-underestimate was now minimal (Figure 3—figure supplement 4). Finally, Spot-On always estimated the bound diffusion constant, DBOUND, with minimal error unlike MSDi or vbSPT, which were not able to accurately estimate DBOUND. However, since there is generally less interest in DBOUND, we did not use this further for evaluating the performance of the different methods. As above, CDF-fitting was performed and the DFREE-estimate and FBOUND-estimate compared to the ground truth for each of the 3480 simulations for which the ground truth is known. Three parameters were estimated in the fit. Spot-On (all) out-performed all other approaches. The mean error (bias) for estimating FBOUND was −1.7%, the inter-quartile range (IQR) was 1.8% and the standard deviation 1.2%. For estimating DFREE the bias for Spot-On (all) was −4.8%, the IQR 3.5% and the standard deviation 3.3%. But as mentioned above, the slight underestimate of DFREE is simply due to diffusion being confined inside a 4 μm radius nucleus (Figure 3—figure supplement 4). This also helps to emphasize the point that diffusion constants measured inside a nucleus should be interpreted as apparent diffusion constants. A large number of papers have use different variations of the MSDi approach (Knight et al., 2015; Li et al., 2016; Liu et al., 2014; Schmidt et al., 2016; Zhen et al., 2016). This approach is of course very sensitive to how the MSD is estimated. For example, it is well-known that accurately estimating diffusion constants from short trajectories (<100 frames) subject to significant localization error is all but impossible as shown by Michalet and Berglund (Michalet and Berglund, 2012). Nevertheless, several papers assign diffusion constants to individual trajectories based on a MSD-fit. While the exact method differs somewhat from paper to paper, the most popular approach is to set a threshold of a certain number of localizations per trajectory (most commonly 5; though we note that some reports explicitly attempt to compensate for the bias introduced by setting such a threshold (Zhen et al., 2016)). Each trajectory with at least five localizations are then fit, often using the Matlab library MSDAnalyzer (Tarantino et al., 2014), and thus assigned an apparent diffusion constant. An additional threshold is then applied: only if the fit to the MSD curve is judged sufficiently good, is the diffusion constant then used. Otherwise the trajectory is ignored. This fitting threshold is frequently set based on the coefficient of determination as R2>0.8 in some recent papers (Knight et al., 2015; Li et al., 2016; Schmidt et al., 2016). Next, after analyzing all trajectories in this way, a distribution of diffusion constants is then obtained. The analysis is then performed on the logarithm of these diffusion constants (‘LogD histogram’) (Knight et al., 2015; Li et al., 2016; Schmidt et al., 2016). Both the CDF (Knight et al., 2015) and PDF (Knight et al., 2015; Li et al., 2016; Schmidt et al., 2016; Zhen et al., 2016) can be considered. These are then fitted with a sum of Gaussian distributions: either two (Knight et al., 2015; Schmidt et al., 2016; Zhen et al., 2016) or three (Schmidt et al., 2016; Zhen et al., 2016). We note that it is not immediately clear which distribution fitted diffusion constants should actually follow (e.g. Log-normal, Gamma, Normal, etc.). No justification is given for sums of Gaussians (Knight et al., 2015; Li et al., 2016; Schmidt et al., 2016), though we note that the fit is often quite good both in the previous reports (Knight et al., 2015; Li et al., 2016; Schmidt et al., 2016) and also here as shown in Figure 3—figure supplement 3. Please note that fitting a sum of normal distributions to the LogD histogram is equivalent to fitting a sum of log-normal distributions to the D histogram. We also note here, that in a theoretical study Michalet previously showed that the distribution of diffusion constants is approximately Gaussian, but only under a set of stringent criteria (Michalet, 2010). Since CDF-fitting is generally less susceptible to noise from binning and since in this comparison Spot-On also uses CDF-fitting, we fit the LogD histogram with a sum of 2 Gaussians using CDF-fitting. We refer to this whole procedure as MSDi (R2>0.8). Examples of fits are shown in Figure 3 and Figure 3—figure supplement 3 and the Matlab code to perform the fitting is available together with the data (see “Data availability’). Five parameters were estimated in the fit. Overall, MSDi (R2>0.8) generally performs reasonably well when it comes to estimating DFREE, but extremely poorly when it comes to FBOUND and DBOUND. The mean error (bias) for estimating DFREE was 8.0%, the inter-quartile range (IQR) was 4.9% and the standard deviation 28.5%. For estimating FBOUND the bias for MSDi (R2>0.8) was −20.6%, the IQR 32.1% and the standard deviation 26.4%. We note that since FBOUND necessarily has to take a value between 0% and 95% in the simulations and since half the simulations have FBOUND<50%, a mean error of −20.6% is actually quite large. Although the bias for DFREE is much smaller, in ~5% of all cases, the error in estimating DFREE is bigger than 2-fold. Moreover, in a few very rare cases, not a single trajectory out of the 100,000 simulated trajectories pass both thresholds (R2>0.8; at least five frames). Why is MSDi (R2>0.8) fitting so unreliable? It is instructive to consider an example. In the example dataset provided with the MSDi code (simulation with DFREE=2; FBOUND=0.75; 1 ms frame rate), the estimated DFREE=2.06 is very good, but the estimated FBOUND=0.16 is extremely poor. Even though the simulation dataset contains 100,000 simulated trajectories, only 3726 of them actually pass the threshold (R2>0.8; at least five frames). Thus, MSDi (R2>0.8) only uses around 4% of the data. Since the tiny fraction of the dataset that is used for analysis is chosen based on how well it fits an MSD-curve and since displacements of bound molecules are dominated by localization errors and therefore generally poorly fit by MSD-analysis, the procedure enriches for the free population, which is why the estimated bound fraction (16%) is so much lower than the true bound fraction (75%). Additionally, we note that MSDi-based analysis is extremely sensitive to the fitting threshold: if instead of R2>0.8, all trajectories had been used the estimated bound fraction would be 87% instead of 16%. In conclusion, MSDi (R2>0.8) is unreliable for estimating FBOUND when short trajectories are at stake, which is the usual case when performing intracellular SPT of fast-diffusing molecules. MSDi (R2>0.8) most likely fails due to a combination of the following reasons among others. First, it poorly handles localization errors, which dominate the displacements of bound molecules. Second, by only considering trajectories of a certain length (normally at least five frames), it only analyzes a small subsample of the dataset. Third, there is no correction for defocalization bias. Since fast-diffusing molecules move out-of-focus and thus have shorter trajectories, the 5-frame threshold introduces a large bias against freely-diffusing molecules. Fourth, the fitting threshold (R2>0.8) is relatively arbitrary and the results of the analysis is extremely sensitive to this threshold. Accordingly, in these simulations MSDi (R2>0.8) only analyzes a small fraction (~5%) of all the trajectories; note that this bias against the bound population provides a compensatory bias against the bound population to account for the bias against the free population due to defocalization bias. Fifth, it is difficult to justify the use of Gaussian distributions. Even in cases where the CDF-fit to the data is excellent, the fitted FBOUND-value is often very far off the ground truth. Thus, the goodness of the fit cannot be used to judge how well the parameter-estimation went. Finally, we note that several variants of the MSDi-based method exist (e.g. the approach used by Zhen et al. (Zhen et al., 2016)) is a bit different than the one used here. However, a full validation test of all MSDi-based methods is beyond the scope of this work. The MSDi (all) analysis was identical to MSDi (R2>0.8) except for a single difference: instead of only using trajectories of at least five frames where the MSD-fit to individual trajectories was judged good (R2>0.8), all trajectories of at least five frames were used, regardless of how good the MSD-fit was. five parameters were estimated in the fit. MSDi (all) analysis performed very poorly both when it comes to estimating DFREE and FBOUND. The mean relative error (bias) for estimating DFREE was −39.6%, the inter-quartile range (IQR) was 19.0% and the standard deviation 41.8%. For estimating FBOUND the bias for MSDi (all) was 22.0%, the IQR 17.8% and the standard deviation 15.8%. Thus, in all but a few edge cases, MSDi (all) cannot reliably estimate DFREE or FBOUND. As for MSDi (R2>0.8), examples of fits are shown in Figure 3—figure supplement 3 and the Matlab code to perform the fitting is available together with the data (see “Data availability’). In the case of MSDi (all), the main reason for the unreliable estimates is due to defocalization bias. Since fast-diffusing molecules move out-of-focus and thus have shorter trajectories, the 5-frame threshold introduces a large bias against freely-diffusing molecules. Overall, consistent with previous benchmarking efforts on membrane proteins (Weimann et al., 2013), MSDi (all) performed least well among the tested methods. vbSPT performs single-trajectory classification using Hidden-Markov Modeling (HMM) and Bayesian inference (Persson et al., 2013) and can assign different segments of a single trajectory to different diffusive states, each associated with a particular diffusion constant. vbSPT uses the information from all the estimates on single trajectories to consolidate an estimate of diffusion coefficients and associated fractions in each state. A specific and rigorous Bayesian statistical model is used to aggregate the parameters estimated on single trajectories to global diffusion states. vbSPT was initially designed for SPT of diffusing proteins in bacteria (Persson et al., 2013), where defocalization biases are virtually nonexistent since the axial dimension of most bacteria are generally comparable to or smaller than the microscope axial detection range. Furthermore, vbSPT does not explicitly model the localization error. It is then expected that the software performs poorly when the localization error is high, as can be expected when imaging intranuclear factors. Over the 3480 simulations, vbSPT accurately estimated both DFREE and FBOUND. The mean relative error (bias) for estimating DFREE was 0.8%, the inter-quartile range (IQR) was 6.8% and the standard deviation 12.5%. For estimating FBOUND the bias for vbSPT was 5.0%, the IQR 6.1% and the standard deviation 4.6%. Thus, vbSPT estimated values were quite consistent (IQR <7% for both DFREE and FBOUND). These values were very close to Spot-On in performance. When looking at the heatmaps (Figure 3—figure supplement 2) more closely, it appeared that vbSPT performs poorly on the estimation of the free diffusion constant when the mean displacements are small. This case occurs either with small free diffusion constants (0.5–2 µm²/s), or with short frame rates (1 ms) and could be explained by the fact that in such conditions, the displacements of the free population and localization error have comparable magnitudes, and that vbSPT does not account for localization error. Regarding the estimate of the fraction bound, vbSPT tends to overestimate it more and more as the mean displacement of the free population increases (that is, either the exposure time or DFREE). This is most likely because vbSPT does not correct for defocalization bias. Thus, the more free molecules diffuse out-of-focus, the more vbSPT will overestimate FBOUND. Finally, we note that these two biases somewhat compensate for each other: not considering localization errors causes a small overestimate of the free population, whereas not correcting for defocalization bias causes an underestimate of the free population. In summary, for conditions where the mean jump length of the free population can be distinguished from the localization error, vbSPT performs reasonably well, while being slightly outperformed by Spot-On. In the case of the 720 simulated SPT datasets for the 3-state comparison, we analyzed the data using the Matlab version of Spot-On (all) and vbSPT. We describe the analysis in details below. As above, CDF-fitting was performed and the diffusion constant- and subpopulation fraction estimates compared to the ground truth for each of the 720 simulations for which the ground truth is known. Five parameters were estimated in the fit. As in the 2-state comparison, Spot-On (all) slightly, but significantly, outperformed vbSPT also in the case of 3 states. The biggest error (bias) in estimating any of the subpopulation fractions was 3% and the biggest standard deviation (3.6% std) was also small (see Figure 3—figure supplement 6 for a full table for statistics). In the case of the diffusion constants, Spot-On also accurately inferred all of these with minimal error. The main limitation of Spot-On 3-state fitting, is that it sometimes gets stuck in local minima (we estimate this happens in <1% of cases). Therefore, it was necessary to increase the number of fitting iterations to 8. Nevertheless, Spot-On was very robust and accurately estimated all five parameters with minimal error and outperformed vbSPT. Although vbSPT was constrained to three states, it occasionally inferred that only 1 or 2 states exist. In case vbSPT inferred less than three states (1 or 2), the inferred diffusion coefficients were matched to the closest diffusion coefficient of the ground truth, and the proportion of the one or two unmatched diffusion coefficients was set to zero. vbSPT generally performed quite well. The maximal error (bias) in estimating any of the subpopulation fractions was 6% and the maximal standard deviation (6.3% std; see Figure 3—figure supplement 6 for a full table for statistics). The main limitation of vbSPT was its inability to infer DSLOW: the mean error (bias) for estimating DSLOW was 36.6% and the standard deviation was 64.7%. Therefore, vbSPT performed almost as well as Spot-On for estimating the subpopulation fractions and for estimating DFAST, but vbSPT was unable to accurately estimate both DBOUND and DSLOW and thus failed when estimating 2 out of the five parameters. In conclusion, vbSPT performs almost as well as Spot-On when estimating subpopulation fractions, but quite poorly when estimating diffusion constants unless they are very high. In order to run Spot-On, the user has to set a number of parameters. While some are determined by the acquisition protocol (e.g. time between frames), others will have to be carefully chosen. We provide a discussion of how to choose these here. Users can either choose to use all displacements from all trajectories (set ‘Use all trajectories’ to ‘Yes’ in the web-version of Spot-On or ‘UseAllTraj = 1’ in the Matlab version of Spot-On) or to use only a subset by controlling the JumpsToConsider variable. For example, consider a trajectory consisting of 6 localizations and without gaps. If JumpsToConsider = 4 and TimePoints = 6, then this trajectory will contribute four displacements to the 1Δτ histogram, four displacements to the 2Δτ histogram, three displacements to the 3Δτ histogram, two displacements to the 4Δτ histogram and one displacement to the 5Δτ histogram. Thus, even though the trajectory contains 5 1Δτ displacements, only the first four will be used for analysis if JumpsToConsider = 4. Why would we want to limit the number of jumps that were used? Since freely-diffusing molecules move out-of-focus, almost all very long trajectories will be bound molecules. For example, a single trajectory of 21 localizations will provide 20 displacements to the 1Δτ histogram, whereas freely diffusing molecules with short trajectories will provide fewer (e.g. 10 trajectories with three localizations would be necessary to also provide 20 displacements to the 1Δτ histogram). Thus, by limiting JumpsToConsider, one is biasing the displacement histogram against bound molecules. However, as demonstrated in the simulations shown in Figure 3—figure supplement 2, whether all jumps or JumpsToConsider = 4 is used has almost no effect on the DFREE-estimate, but using JumpsToConsider = 4 causes FBOUND to be underestimated by on average of −5% (percentage points) relative to SpotOn (all). We see a similar ~5–10% difference between Spot-On (four jumps) and Spot-On (all) on the experimental spaSPT data shown in Figure 4. As we have discussed previously (Hansen et al., 2017), restricting JumpsToConsider to four is a way one can compensate for all the many acquisition biases (such as motion-blur) that generally cause undercounting for fast-diffusing molecules and which cannot readily be taken into account in simulations. While the optimal value will depend on the trajectory length distribution (JumpsToConsider should not take a value much smaller than the mean trajectory length), we found that JumpsToConsider = 4 provides a good compromise for our experimental data. We strongly recommend including experimental controls (such as histone H2B-Halo and Halo-3xNLS to ensure that experimental and analysis parameters have been reasonably set). Spot-On considers how the histogram of displacement changes over time for multiple Δτ. The number of Δτ that will be considered is equal to the number of timepoints – 1. So, if timepoints = 8, the displacements from 1Δτ to 7Δτ will be considered. How many timepoints to consider will depend on how much data you have and the frame-rate. For example, if the mean trajectory length is two frames, setting timepoints to 20 will cause problems since only a tiny fraction of trajectories will be at least 20 frames long and thus contribute to the 19Δτ histogram. Moreover, the correction for defocalization is approximate, so considering timepoints where more than >95% of free molecules have moved out-of-focus is also not recommended; when this happens will further depend on the free diffusion constant. Nevertheless, as long as there is sufficient data to reasonably populate the displacement histograms at all timepoints, Spot-On is highly robust to how this parameter is set (Figure 3—figure supplement 8). As a rule of thumb we generally do not recommend setting timepoints above 10 or considering Δτ beyond 80 ms.
Spot-On almost always converges optimally in the first iteration, so generally 2 or three is more than sufficient when using the 2-state model. For the 3-state model, the parameter estimation is more complicated and here we recommend eight iterations as a starting point. Although for large datasets PDF- and CDF-fitting perform similarly as shown in Figure 3—figure supplement 9, CDF-fitting tends to provide more reliable estimates of DFREE and FBOUND when the number of trajectories decreases, likely because PDF-fitting is more susceptible to binning noise. Thus, for quantitative analysis we always recommend CDF-fitting, though PDF-fitting can be convenient for making figures since most people find histograms more intuitive. Spot-On can either use a user-supplied localization error or fit it from the data. As long as there is a significant bound fraction, Spot-On will infer this with nanometer precision (Figure 3—figure supplement 11), though we note that this is an average localization error that mostly reflects the localization error of the bound fraction, and the actual localization error for each individual localization will vary (Deschout et al., 2012; Lindén et al., 2017). In cases, where the bound population is very small, fitting the localization error can be less accurate. Thus, in situations where comparisons are being made between the same protein under different conditions or e.g. between different mutants of the same protein, we recommend fitting to obtain a mean localization error and then keeping it fixed in the comparisons. Spot-On comes with default allowed ranges. For example, for the 2-state model, DFREE=0.5;25 and DBOUND=0.0001;0.08. These ranges are generally reasonable, but may not be appropriate for all datasets. Whenever Spot-On infers a diffusion constant that is equal to the min or max, caution is needed and it may be necessary to change these limits. In particular, unless a molecule is bound to an unusually dynamic scaffold, DBOUND=0.08 µm²/s is almost certainly too high. Thus, we recommend imaging a protein that is overwhelmingly bound, such as histone H2B or H3, fitting the histone data with Spot-On and then use the inferred DBOUND for histone proteins or a slightly larger value as the maximally allowed DBOUND value. Spot-On considers either a 2-state or 3-state model. Since the 3-state model contains two additional fitted parameters, the 3-state fit is almost always better. While there are many cases where a 2-state model would be inappropriate (e.g. a transcription factor that can exist as either a monomer or tetramer, thus exhibiting two very different diffusive states), generally speaking, we prefer fitting a 2-state model for most transcription factors or similar nuclear chromatin-interacting proteins. In part, deviations from the 2-state model will be due to anomalous diffusion and confinement inside cells, which cause deviation from the ideal Brownian motion model implemented by Spot-On. For this reason, traditional model-selection techniques such as Akaike’s Information Criterion (AIC) or the Bayesian Information Criterion (BIC) can also be misleading. To obtain a good single-molecule tracking dataset, a series of requirements have to be met. First of all, it must be possible to image single-molecules at a high signal-to-noise ratio. This is now relatively straightforward thanks to developments in fluorescence labeling strategies and imaging modalities (Lavis, 2017; Liu et al., 2015). The development of the HaloTag protein-labeling system and bright, photo-stable organic Halo-dyes such as TMR and the JF dyes (Grimm et al., 2015) now make it possible to easily visualize single protein molecules inside live cells. Moreover, imaging modalities such as highly inclined and laminated optical sheet illumination (‘HiLo’)(Tokunaga et al., 2008) are relatively straightforward to implement and combined with a high-quality EM-CCD camera make it possible to image single-molecules at high signal-to-noise suitable for generating high-quality 2D SPT data. For details of our imaging setup, which combines HaloTag-labeling with HiLo-illumination and which is relatively common and easy to operate, please see the methods section. But we note that many other imaging modalities, e.g. light-sheet or even epi-fluorescence imaging can generate high-quality single-molecule tracking data. Spot-On addresses point 3 and 4, as described elsewhere, but point 1 and 2 must be addressed in the experimental design. We discuss strategies to minimize these biases below (spaSPT). Thus, even for a relatively slowly diffusing protein, with a 10 ms exposure we should expect almost half (48%) of all free molecules to show significant motion-blurring, if we assume that molecules move with a constant speed during the exposure. The most straightforward solution, therefore, is to limit the exposure time: in the limit of an infinitely short exposure time, there is no motion-blur. In practice, most EM-CCD cameras can only image at ~100–200 Hz for reasonably sized ROIs. Moreover, it is generally desirable for the mean jump lengths to be significantly bigger than the localization error, thus for most nuclear factors in mammalian cells it is not desirable to image at above >250 Hz. Accordingly, a reasonable solution is therefore to use stroboscopic illumination. That is, using brief excitation laser pulses that last shorter than the camera frame rate (e.g. 1 ms excitation pulse, 10 ms camera exposure time for a 100 Hz experiment): this achieves minimal motion-blurring while maintaining a useful frame-rate. However, this highlights a key experimental trade-off: shorter excitation pulses minimize motion-blurring, but also minimize the signal-to-noise. Therefore, a reasonable compromise has to be determined. Here we use 1 ms excitation pulses: this achieves minimal motion blurring (0.067% > 320 nm using D = 3.5 μm2/s) and still yields very good signal (signal-to-background >5). But users will need to decide this based on their expected D and their experimental setup (signal-to-noise). Moreover, different localization algorithms (Chenouard et al., 2014; Deschout et al., 2012) have different sensitivities to motion-blurring; thus, the extent of the bias will also depend on the user’s localization algorithm. As we show here, in the case of the MTT-algorithm (Sergé et al., 2008), the estimation of D is quite sensitive to motion-blurring, but the estimation of the bound fraction is less sensitive as long as the diffusion constant is <5 μm2/s. But other localization algorithms may be more or less sensitive. Generally speaking, we do not recommend imaging at a signal-to-background <3 and do not recommend using excitation pulses >5 ms, but the optimal conditions will need to be determined on a case-by-case basis. In conclusion, experimentally implementing stroboscopic excitation makes it possible to minimize the bias coming from motion-blurring, while still achieving a sufficient signal for reliable localization. It is necessary to minimize tracking errors in order to obtain high-quality SPT data. Tracking errors bias the estimation of essentially all parameters we could want to estimate from SPT experiments including diffusion constants, subpopulations, anomalous diffusion etc. While many different tracking algorithms exist, it is fundamentally impossible to perform tracking, that is connecting localized molecules between subsequent frames, at high densities without introducing many tracking errors. Thus, the simplest solution is to image at low densities: in principle, if there is only one labeled molecule per cell, there can be no tracking errors. Yet, because dyes generally bleach quite quickly under most SPT imaging conditions, this has traditionally led to a serious trade-off between data quality and the number of trajectories which can be obtained. However, with the recent development of bright photo-activatable JF-dyes (Grimm et al., 2016a; 2016b) (PA-dye), it is now possible to combine the superior brightness of the Halo-JF dyes with photo-activation SPT (also called sptPALM (Manley et al., 2008)). That is, a large fraction of Halo-tagged proteins in a cell can be labeled with Halo-PA-JF dyes and then photo-activated one at a time: this allows imaging at extremely low densities (<1 fluorescent molecule per cell per frame) and nevertheless tens of thousands of trajectories from a single cell can be obtained. Thus, PA-dyes now make it possible to nearly eliminate tracking errors without compromising on signal-to-noise or amount of data. In fact, imaging at extremely low densities generally also improves signal-to-noise since out-of-focus background is reduced and overlapping point emitters are avoided (Izeddin et al., 2014). Nevertheless, even with paSPT it is still necessary to decide on an optimal density. The key parameters are size of the ROI (ideally the whole nucleus for studies in cells) and D: a large nucleus and a slow D can support a higher density than fast-diffusing molecules in a small nucleus. As a general rule of thumb, we recommend a density of ~1 fluorescent molecule per ROI per frame. This will keep tracking errors at a minimum and still support rapid acquisition of large datasets. All data acquired for this study was acquired at approximately this density. In practice, keeping an optimal density will require some trial-and-error optimization of the 405 nm photo-activation laser intensity. 405 nm excitation does contribute background fluorescence, so we prefer to pulse the 405 nm laser during the camera ‘dead-time’ (~0.5 ms in our case) to avoid this. Moreover, this also makes it easier to keep the photo-activation level constant when changing the frame rate. However, the optimal photo-activation power will depend on the expression level of the protein, protein half-life and the dye concentration and will therefore have to be optimized in each case. We recommend recording initial datasets and then analyzing them using Spot-On which reports the mean number of localizations per frame and then using this information to determine the optimal photo-activation level. However, even then some cell-to-cell variation may be unavoidable: especially in transient transfection experiments where there is large cell-to-cell variation in expression level or when studying proteins expressed from stably integrated transgenes (e.g. Halo-3xNLS and H2b-Halo in our case). In these cases, some cells will likely exhibit too high a density. To deal with this, Spot-On includes the option to analyze datasets from individual cells first and then excluding a cell with too high a density before analyzing the merged dataset. Which datasets are appropriate for Spot-On? In the sections above, we have discussed how to minimize common experimental biases in SPT experiments and proposed spaSPT as a general solution. However, many 2D SPT datasets recorded under different conditions are also appropriate for Spot-On. For example, SPT experiments without photo-activation or with continuous illumination may also be appropriate for analysis with Spot-On. For example, there may be situations where photo-activation SPT is not possible: in such cases, it will be essential to keep the labeling density sufficiently low that tracking errors are minimized and it might thus be necessary to image substantially more cells to get enough statistics. Likewise, as we show in Figure 4JK, motion-blurring is a major concern for fast-diffusing molecules, but for a slowly diffusing molecule like Halo-CTCF it makes only a small difference. Thus SPT datasets recorded with continuous illumination may also be appropriate provided that the protein of interest is known to diffuse sufficiently slowly. We also note that since Spot-On uses the loss of fast-diffusing molecules over time to correct for bias and to estimate the free population, it is essential that all trajectories are included in Spot-On for analysis. For example, some tracking and localization algorithms ignore all trajectories below a certain length (e.g. five frames), but this will cause Spot-On to misestimate the loss of molecules moving out-of-focus and thus it is imperative that trajectories of all lengths be included when analyzing data using Spot-On. Furthermore, trajectories of only a single localization are required to accurately compute the average number of localizations per frame, which is a key quality-control metric for SPT data. Moreover, Spot-On does not currently support 3D SPT data. Furthermore, Spot-On assumes diffusion to be Brownian. This is a reasonable approximation even for molecules exhibiting some levels of anomalous diffusion as shown in Figure 4—figure supplement 2, but Spot-On is not appropriate for molecules undergoing directed motion (e.g. a protein moving on microtubules). Additionally, in cases where there are frequent state transitions at a time-scale similar to the frame rate (e.g. transcription factor with a 10 ms residence time imaged at 100 Hz), Spot-On may give inaccurate results since it ignores state transitions (Figure 3—figure supplement 10). Finally, the correction for molecules moving out-of-focus assumes that molecules are not fully confined within small compartments, that prevent molecules from moving out-of-focus. We propose that published single-particle datasets be published and reported accompanied with the following metadata. We suggest that these metrics constitute a minimal reporting guideline for single-particle datasets and subsequent kinetic modeling (though additional information may be appropriate and necessary in some cases). Obviously, if a 3-state model is used, the bounds for the additional subpopulation should also be reported. In case a custom-modified version of Spot-On is used, we recommend that the code be made available and that a summary of the modifications be included in the methods section. Physical Review E, 82, 10.1103/PhysRevE.82.011917, 20866658. Angewandte Chemie International Edition 55:1723–1727. Chemistry is dead. Long live chemistry! Phys. Chem. Chem. Phys. 16:24128–24164. Physical Review E, 82, 10.1103/PhysRevE.82.041914. Physical Review E, 85, 10.1103/PhysRevE.85.061916, 23005136. Quantifying transcription factor kinetics: at work or at play? Critical Reviews in Biochemistry and Molecular Biology 48:492–514. The Journal of Cell Biology 204:231–245. Physical Review E, 89, 10.1103/PhysRevE.89.022726, 25353527. Thank you for submitting your article "Spot-On: robust model-based analysis of single-particle tracking experiments" for consideration by eLife. Your article has been reviewed by two peer reviewers, and the evaluation has been overseen by a Reviewing Editor and Kevin Struhl as the Senior Editor. The following individual involved in review of your submission has agreed to reveal his identity: Lothar Schermelleh (Reviewer #2). This 'Resource' manuscript describes an integrated approach for single-particle tracking (SPT) microscopy using stroboscopic photoactivation (spaSPT) and present "Spot-On", an open-access software analysis tool for SPT data. The latter can be applied to any kind of SPT data and uses model fitting to calculate diffusion rates and bound and mobile population sizes. The authors convincingly validate and compare their approach with other available tools using ground-truth simulations and analysing a number of Halo-tagged nuclear proteins with differential dynamic properties in U2OS cells and labelled with photoactivatable JF dyes. Both reviewers are enthusiastically supportive of this being published, although a small number of minor comments and corrections are appended below. 1) A practical issue – could some of the information on the website also be loaded as a supplemental tutorial file (some helpful screenshots?)? 2) The software in its current form is restricted to 2D-SPT analyses. Why is 3D-tracking not implemented, and is there a planned route for a future upgrade? With many imaging systems offering astigmatism-based 3D localisation option, would this not offer potential benefits? We understand that a package for 3D analysis may be out of the scope of the present article, but whether there is a prospect for such a package in the future might be indicated/commented on. 3) Along with the software, the authors describe spaSPT as a beneficial approach to minimize motion-blur and tracking errors. What would be the difference between spaSPT and SPT with very low concentration of non-photoactivatable JF dyes? The authors may want to discuss application of Spot-On with alternative imaging approaches in cases where photoactivation is either not possible (e.g. due to lack of laser lines or suitable dyes) or not desired (potential damage, blue channel is already used). 4) It would be desirable to have a function for visualising tracks with the option to differentially select and display subsets of tracks that fall into different categories (immobile/mobile or other criteria). This would enable the user to directly see spatial patterns of differential dynamics. 5) i) Figure 4K and subsection “Effect of motion-blur bias on parameter estimates”, first paragraph: Why is there is a small but significant difference between PA-JF549 and PA-JF646? ii) Subsection “Validation of Spot-On using spaSPT data at different frame rates”: The axial detection range should be specified (around 700 nm?). iii) Abbreviations CDF and PDF may need to be introduced in the main text as well, not only the figure legend. iv) Figure 4—figure – supplement 3 legend – last paragraph: Does the "total bound fraction of ~60-65%" refer to Halo-Sox2? Please specify. […] Both reviewers are enthusiastically supportive of this being published, although a small number of minor comments and corrections are appended below. This is a good suggestion. We adapted the online tutorial and attach it as Supplementary file 1. To accommodate future revisions of the interface, it includes a reference to the online version, that will follow the upgrades of the platform. This is a very interesting suggestion and one we have thought a lot about. Currently, there are two main options for 3D tracking: 1) PSF shaping (such as astigmatism)-based 3D SPT (e.g. cylindrical lens or adaptive optics) and 2) 3D SPT using a Multi-Focal Microscope (MFM) (Abrahamsson et al., Nature Methods, 2013). We will discuss both here. 1) astigmatism-based 3D SPT data will give a truncated 3D displacement distribution. In x,y there are minor restrictions on displacement lengths, but in z, the max displacement will be equal to the axial detection range (~700 nm total; 0 +/- 350 nm). For example, a molecule 200 nm above the focal plane, will defocalize if it moves more than 150 nm up or more than 550 nm down. For this reason, the expected distribution of 3D displacements is not the simple 3D Brownian distribution, but a complicated convolution of a truncated axial distribution (max 700 nm; position-dependent) and the 2D x,y-distribution considered by Spot-On. To our knowledge there is no straightforward way of extending the z-correction currently implemented in Spot-On to 3D. The simulations in Author response image 1 compare the jump length distributions derived from data simulated (D=6.0µm²/s, dt=13ms, sigma=35nm) inside a nucleus of diameter 8µm with increasing axial detection range (400nm, 700nm and full nucleus). Although (right panel) the 2D projection from simulated data is only marginally affected by changes in the axial detection depth, in 3D (left panel), the jump length distribution is sensitive to the axial detection depth, and the lower the axial detection depth, the more truncated the distribution. More work is necessary to determine how mathematically tractable this problem is (and we agree that this will be an interesting future direction), but currently we are not sure if the additional information justifies the approach and of course 3D-astigmatism data can always be 2D-projected and then analyzed by Spot-On. 2) the truncated 3D displacement distribution issue can in theory be solved with MFM which can in principle yield whole-nucleus 3D SPT data. However, this comes with serious limitations. First, in the 9-focal plane implementation, the signal is split into 9 and due to other losses, the signal-to-noise is reduced by about a factor of ~15-20. Although the JF-dyes are very bright, this big a loss of signal is a serious limitation. Second, since the full field-of-view is required, the frame rate is necessarily slow (33 Hz in Chen Cell 2014 with EM-CCD). While sCMOS cameras might solve the speed issue, this comes at the cost of further loss of signal. Thus, in MFM-based 3D SPT, continuous illumination was necessary to collect enough signal resulting in 30 ms continuous exposure time. This leads to serious motion-blurring and likely undercounting of the fast-moving population. Third, while incredibly elegant, the MFM microscope is quite complicated to set up (we have set it up in our lab recently) and not in regular use in many labs. But as the reviewers also suggest, this is likely to improve in the future, though we note that no Z-correction for defocalization would be necessary in whole-nucleus MFM. This is an important point and as the reviewers suggest, there is in principle no difference between doing SPT with very low concentrations of non-PA dye and spaSPT. It’s just that with non-PA dyes, once the dyes have bleached no more data can be obtained from the cell in question and thus, many more cells have to be imaged to obtain enough data. So spaSPT is more convenient. But to clarify this important point, we now write: “We also note that although Spot-On was validated on spaSPT data, SPT data with non-photoactivatable dyes is also suitable for Spot-On analysis provided that the density is sufficiently low to minimize tracking errors. (see also Appendix 3: “Which datasets are appropriate for Spot-On?”)”. We thank the reviewers for this important consideration. Indeed, track visualization is crucial as it can be used both to (1) perform quality controls and spot several kinds of biases and (2) refine data analysis, for instance using track segmentation and we discuss both below. Quality controls (1): visual inspection of the output of the tracking algorithm is indeed crucial, and can be used to detect biases such as tracking errors or issues with a detection threshold. In that case, such visual inspection is much more useful when trajectories and raw images can be overlayed. To draw the full potential of such approach, one would need to upload the raw data to Spot-On, in addition to the tracked data. Although tracked datasets (trajectories) are easily amenable to online processing (a typical SPT tracking file has a size of the order of a few MB), raw images often weigh several GB, making their interactive processing more challenging. For this reason, we do not believe such an option will work for a web-based platform like Spot-On. Conversely, several imageJ/Fiji plugins are capable of interactive display of raw images and trajectories. In our opinion, one of the most mature Fiji plugins is TrackMate (Tinevez et al., Methods, 2017). TrackMate can save/reopen tracking files that contain a full description of the tracking parameters, allowing for a careful inspection of the raw movies and overlaid trajectories. In order to facilitate the integration between a track-visualization software (TrackMate) and a SPT analysis tool (Spot-On), we developed a “TrackMate to Spot-On connector” (available at: https://gitlab.com/tjian-darzacq-lab/Spot-On-TrackMate). This plugin adds an extra menu to TrackMate that allows a one-click upload of a dataset to Spot-On. Thus, a manually inspected file can automatically be uploaded to Spot-On. We now mention this tool: “Spot-On does not directly analyze raw microscopy images, since a large number of localization and tracking algorithms exist that convert microscopy images into single-molecule trajectories (for a comparison of particle tracking methods, see (Chenouard et al., 2014); moreover, Spot-On can be interfaced with TrackMate (Tinevez et al., 2017), which allows inspection of trajectories before uploading to Spot-On).” Finally, we acknowledge that this approach restricts the inspection of trajectories to the ones tracked using the TrackMate software, and that a tool accepting a wider range of file formats would be desirable. Our group is currently pursuing efforts in that direction, but this is a longer-term project that is not within the scope of this paper. Track segmentation/classification (2): even though Spot-On can infer diffusion constants and relative fraction of several subpopulations, it does not perform single-trajectory classification. Indeed, this latter problem is significantly harder, or even impossible, depending on the length of the track to classify (see for instance Michalet and Berglund, 2012), and several recently developed approaches already deal with this problem (Persson et al. 2013, Monnier et al., 2015), mostly relying on hidden Markov models (HMMs). Furthermore, since trajectories derived from 3D-diffusing factors entering and exiting the focal plane are inherently short, only a very small fraction of them are actually amenable to single-trajectory inference. Therefore, while we agree that assigning trajectories into particular subcategories (e.g. immobile vs. mobile) is interesting, since HMM-based approaches already exist, we feel that adding this functionality is outside the scope of this paper. In summary, we thank the reviewers for the suggestion and have implemented a one-click open-source connector between TrackMate and Spot-On that makes visualizing the trajectories before uploading them to Spot-On easy and intuitive. This is a good point and we have noticed this as well. For proteins with a significant bound fraction (i.e. >25%), we find that both PA-JF549 and PA-JF646 give identical results. However, we find that for proteins with a negligible bound fraction (e.g. Halo-3xNLS or Halo-CTCF without the DNA binding domain), PA-JF646 has a “bound fraction floor” of about 10-15% which it cannot go below, whereas PA-JF549 appears to be able to capture the dynamics of all proteins and we have observed bound fractions <5% for PA-JF549. We believe this is the reason for the difference and we are pretty confident in this effect: it has been highly reproducible in both U2OS and mES cells and we have observed it for several different proteins. We do not have a clear explanation for this, however; one possibility is that JF646 and its conjugates are a little more hydrophobic due to the extra methyl groups in the Si-rhodamine structure. This effect is unlikely to be a case of tracking “free dye ligand”, since JF646 shows negligible photoactivation unless bound to the HaloTag (see Grimm 2016) and since small dyes like JF549/646 are expected to have diffusion constants ~250 um2/s and thus are unlikely to be trackable. Since we do not have a clear explanation of this effect, we prefer not to speculate in the manuscript, but we now state that JF549 appears to be more reliable for SPT (which could be helpful to know for other labs) and specifically write that “Similar results were obtained for both dyes for proteins with a significant bound fraction, but we note that JF549 appears to better capture the dynamics of proteins with a minimal bound fraction such as Halo-3xNLS (Figure 4J-K)”. Yes, we agree and have updated the sentence. Thanks for pointing this out. iv) Figure 4—figure supplement 3 legend – last paragraph: Does the "total bound fraction of ~60-65%" refer to Halo-Sox2? Please specify. Thanks for catching this error. The reviewer is correct; it referred to Halo-Sox2 and we have now corrected this. ASH and MW contributed equally to this work and are alphabetically listed. We are very grateful to Davide Mazza who inspired this work and provided invaluable comments on Spot-On, to Florian Mueller for suggestions on the web-application, Christophe Zimmer for insightful discussions, David McSwiggen and Sheila Teves for kindly providing cell lines, Carolyn Elya and Chiahao Tsui for the name ‘Spot-On’, and to members of the Tjian/Darzacq labs and Maxime Dahan for discussions. We also thank Astou Tangara and Anatalia Robles for microscope maintenance. ASH is a postdoctoral fellow of the Siebel Stem Cell Institute. This work was supported by NIH grants UO1-EB021236 and U54-DK107980 (XD), the California Institute of Regenerative Medicine grant LA1-08013 (XD), by the Howard Hughes Medical Institute (003061, RT) and used the computational and storage services (TARS cluster) provided by the IT department at Institut Pasteur, Paris. © 2018, Hansen et al.